As another part of the Ultimate Guide to Pipette Tips, we want to help you reduce the carbon footprint of your laboratory practices. From the ground up, here are a few ways that your own laboratory can cut back on waste and have a positive impact on the world around you. Use ‘Turn Off’ stickers to remind employees to turn off room lights and equipment that is not being used. Turn off fume hoods when not in use. Fume hoods are one of the biggest energy hogs in the laboratory. Keeping them closed when not in use will save a significant amount of energy. In a study published by the Department of Energy, proper closure of a fume hood can result in saving of up to $6000 per year. Consider enrolling your laboratory in the Shut the Sash fume hood competition through Harvard University. Power down your computers at night, as long as they are not actively in use. You can also set them to sleep mode to reduce energy usage. Unplug small appliances that are not being used. Phantom energy usage (the drawing of electricity by items that are plugged in but not in use) can be eliminated completely by simply unplugging unused appliances. Check out the Public Broadcasting System for more information about blocking phantom energy usage. Lower the thermostat. When employees go home every night, set the thermostat to a lower temperature. There is no need to waste energy heating a laboratory when no one is working. The lab coats will keep everyone warm in the morning. Use task lighting rather than overhead lights. Overhead lighting can make up 10-20% of a laboratories energy use. Illuminating your work desk requires significantly less energy than lighting up the entire laboratory with overhead lighting. Keep your water bath covered. This will help prevent heat loss, resulting in lowered energy usage. It will also reduce maintenance time and water use. Install energy efficient light bulbs wherever you can. Over the life of the bulb, this will save you quite a bit of money. Run the autoclave sparingly. While you definitely need to run the autoclave regularly, see if neighboring laboratories can help fill it up before you hit the power button. Running an autoclave uses about 45 kWh per day or about $5.40 which can add up over time. You may be able to find a service in your area that will provide a laboratory energy audit to help guide your sustainable laboratory development. Once you measure your energy usage, you can decide the best way to cut back to save money and reduce your carbon footprint. 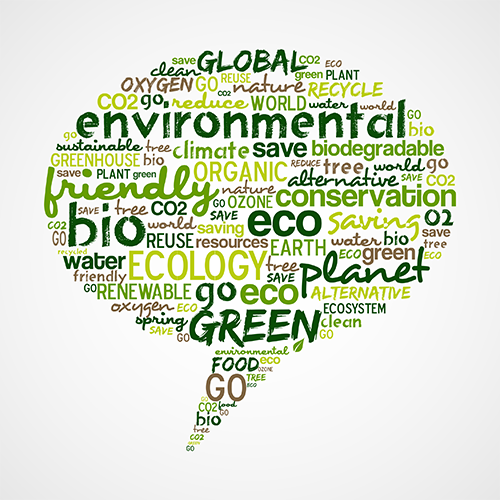 Maintaining equipment needs to be a major part of your eco-friendly laboratory checklist. Freezers, especially, need to be evaluated regularly in order to reduce your carbon footprint. A single ultra-low freezer on average uses ~8000 kWh (~$1000 in annual cost), enough to power an entire house for about 9 months. By maintaining them properly, you ensure that they will continue to function at peak performance levels for as long as possible. This means one less freezer ends up in the landfill due to improper maintenance. You will also significantly reduce your laboratory’s energy usage since improperly maintained equipment generally requires more energy to run efficiently. Here are a few tips for maintaining your laboratory freezers to ensure longevity and peak performance. Before purchasing your laboratory freezer, evaluate its energy usage. Only invest in freezers that are energy efficient. Research the life expectancy of your potential new freezer as well so it can be a part of your eco-friendly laboratory for many years to come. If you don’t need a complete freezer for yourself, consider sharing the freezer with a neighboring laboratory. That way, you are not powering two freezers that are half empty. See more collaborative options below. Location is key when it comes to reduced energy usage. Do not place your freezer near a heating vent or in direct sunlight. Keeping the room temperature lower will also help the freezer last longer and use less energy. Stop standing with the door open. Just like in your own home, standing with the door open while you peruse the contents of your freezer is a huge waste of energy. Take an inventory of your freezer and place it on the front of the freezer or in a book nearby. Look to see what you need and where it is before opening the door to retrieve it. Make sure all containers are clearly labeled to make retrieval faster. Adopt energy-efficient freezer maintenance procedures. Check the seals regularly and replace as needed to prevent the loss of cold air. Defrost the freezer on a regular schedule. Make sure to check the user manual or talk to the brand representatives before tackling this project. Place a schedule on the wall and make sure that it is done routinely. Clean out the freezer often. When freezers get too full, people tend to think they need another one. If old material is removed and discarded, you free up plenty of space for new samples without buying a second freezer. Make sure your laboratory personnel understand procedures for freezer usage and maintenance. Without everyone on board, it is hard to keep freezers organized and running efficiently. Call for an all hands on deck laboratory meeting. Discuss the need to reduce waste in the laboratory and brainstorm a few ideas with your employees. Hang signage in appropriate areas as a reminder of your eco-friendly laboratory practices (ie: when, how and what to recycle). Investigate laboratory Freecycle options in your area. Unwanted or unneeded items can be donated to nearby laboratories that have a need for them. If an organization like this doesn’t exist where you are, consider starting one! Place a recycling bin in the laboratory for paper to be recycled. Place another one in the break room for the recycling of aluminum cans and plastic water bottles. Do not throw away broken equipment. Call your representative and ask about repair options. If that is not feasible, ask if they have a recycling program for unwanted equipment. Purchase only what you need. Do not buy chemicals and reagents in bulk to save money if they will not be used up completely before the expiration date. Dishwashers for laboratory glassware should not be run unless the machine is full. Running half loads of beakers results in excess water usage that is bad for our planet as well as your budget. Buy fewer individually wrapped items. Obviously, anything sterile needs to be individually wrapped. However, if sterility is not an issue, consider buying items that are packaged in bulk. Make sure that all hazardous waste is disposed of properly. While laboratories cannot always control the amount of chemical waste they produce, they can certainly make sure it is disposed of the right way. Check out the American Chemical Society for an online booklet about reducing waste in the laboratory. While cost is obviously a factor when it comes to laboratory purchases, it should not be the only factor you take into consideration. There are products on the market today from companies that are concerned with their sustainability. Do some research before you open up your next scientific catalog. Here are just a few ways that your laboratory can start making more sustainable purchases this year. Consider reload options for your highly consumed pipette tips. Biotix offers a number of reload solutions including CleanPak™ and Tip Eject®. These are a great solution to help maximize lab space, reduce plastic waste, and save money. For non sterile applications considering purchasing re-usable glass pipettes and buffer concentrates. For example 10X PBS versus 1X PBS can save nine plastic bottles per use. 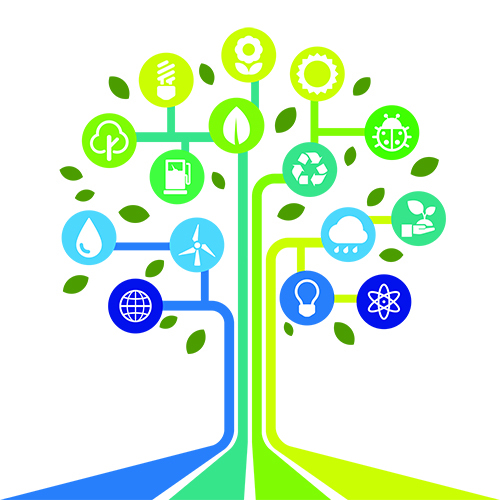 Consider transitioning your laboratory to products made from non traditional bioplastics. Look for peer reviewed studies comparing results using traditional plastic supplies and newer, more environmentally friendly options. Investigate plastic supplies that are created with less plastic than conventional products. Thin walled plastics may still have to be disposed of, however they will result in significantly less plastic waste than conventional plastic products. 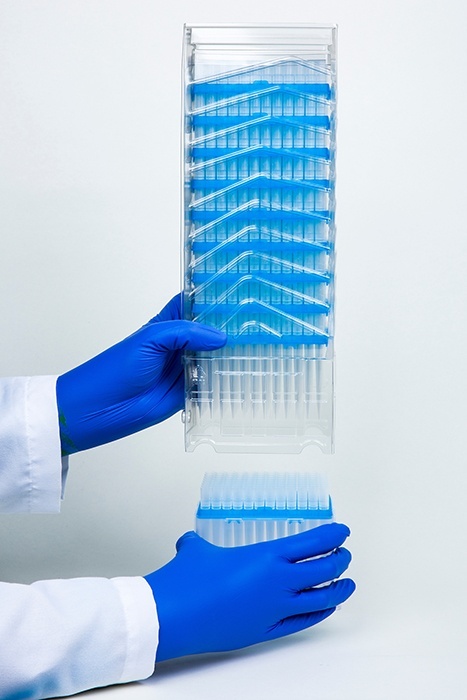 The new Biotix Optimus pipette tip rack uses over 1/3 less plastic than the competition while providing stability in and SBS footprint at the same time. A lab that uses 100 cases a year would save 800 lbs of plastic annually by switching to tips and racks with one third less plastic. Rather than buying pipette tips pre-racked, refill your old racks by purchasing your tips in bulk or other waste reducing packaging. Encourage rack loading at your next laboratory meeting or budget for a part time employee to help with laboratory maintenance. Or use it as an initiation ritual for new lab members. 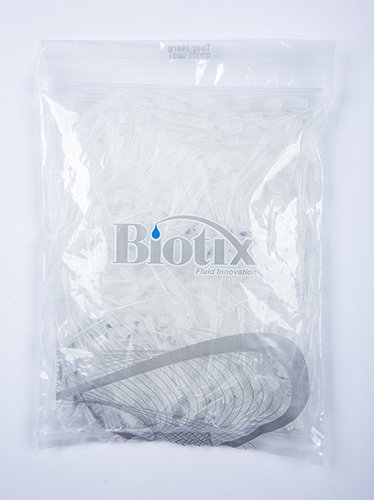 Biotix offers bulk tips in 100% recyclable bags. Look for items made with recycled plastics. Test tube racks and conical tubes are two supplies that are often made with materials that have been recycled. Rethink your hazardous waste purchases. Research newer and less toxic methods to achieve the same results. Less hazardous waste in a laboratory is always a good thing. Order a variety of sizes of plastic tips and tubes. Encourage your employees to use the smallest option that will work for their experiments. This also results in better accuracy or measurements. Buy reusable whenever possible. Glass or reusable plastics are a much greener option than disposable plastics. You will also save a significant amount of money by not throwing as many things away. Choose greener cleaning products. From paper towels made with recycled paper to environmentally friendly floor cleaners, there are hundreds of green cleaning products on the market today. Consider trying something new in your sustainable laboratory. Host a yearly laboratory clean out and trade with neighboring laboratories before you consider buying something new. Your lab buddies next door may have just the product you need that they aren’t using any more. When designing your eco-friendly laboratory, the items you purchase every day will have a huge impact on your carbon footprint. Make sure you are shopping with the environment in mind in order to create a truly sustainable laboratory. 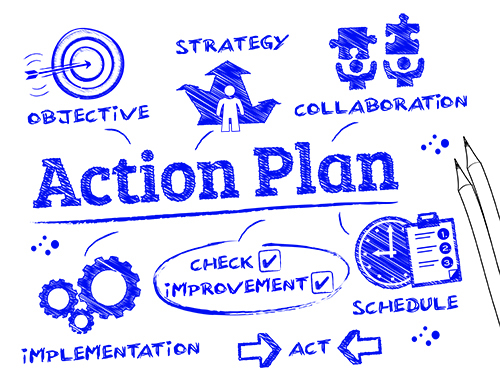 It is essential to get as many lab members on board to initiate and maintain your efforts.